Kids' Book Review: Review: No, Nancy, No! No, Nancy, No! is a fun new lift the flap book. Nancy has a pet named Roger, who is a 'sausage dog'. Together Nancy and Roger explore the city of London, intent on finding two children who dropped their bear at Buckingham Palace. They travel to many places visitors to the city are attracted to. Piccadilly Circus, Trafalgar Square, St Paul's Cathedral, museums, London Zoo, the Tower of London, and lots more are all on the itinerary. Nancy is always just a bit too far behind the two children, but keeps going - catching a red double decker bus, riding a boat on the Thames, and hailing a black London cab. There are surprises waiting around each corner. Make sure you lift the flaps to see what mischief Nancy and Roger find. Look closely at the pictures and you will see that at different points along the way, someone new joins the chase after Nancy and Roger themselves. You'll spot a guard from Buckingham Palace, a policeman, a penguin, a Beefeater from the Tower, and a sailor. And at the end, when Nancy finally catches up with the children, there's one last, big surprise. You might be able to guess what it is if you think about where the children were first spotted. 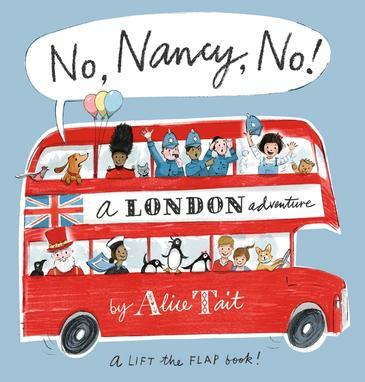 There's a lot of detail in the illustrations, and many flaps to lift, which makes No, Nancy, No! a really interactive experience, and one that lets you experience visiting London from wherever you are reading.